“Edward Feser’s book is a timely wake-up call to the many people who have been seduced by the amateurish attempts at philosophy of religion found in the popular bestsellers of the `Faithless Foursome,’ Dawkins, Dennett, Hitchens, and Harris.“Feser shows that the so-called `New Atheism’ is just the old atheism, only more irrational. But at the same time as carrying out his incisive critique of all that is bad in contemporary popular atheism, he presents an admirable 101 course in philosophy for people who care. About what? About the classical metaphysical tradition going from the best of the ancient Greeks, through the medieval philosophers, and down to the neo-Aristotelianism and neo-Thomism of today. Richard Dawkins, the Oxford biologist and prominent atheist, argues in The God Delusion that belief in God is outdated. Before 1859, it was reasonable to think that life on earth had been designed…. But, Dawkins maintains, Charles Darwin changed all that. He showed that adaptations could be explained by natural selection. No appeal to an intelligent designer is required. Darwin thus made it possible to be an intellectually fulfilled atheist. 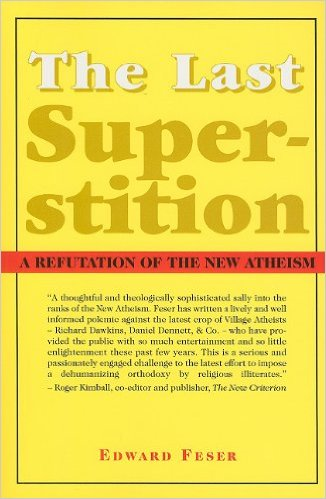 Professor Edward Feser argues in his brilliant new book The Last Superstition: A Refutation of the New Atheism that Dawkins has it all wrong. God is not a hypothesis, to be replaced if a more satisfactory theory comes up. Quite the contrary, Feser suggests, the existence of God can be proved by rationally compelling arguments. He thinks that not only is Dawkins wrong about this but so are his fellow atheists Christopher Hitchens and Sam Harris, all three of whom are frequently subject to humorous and telling remarks. Feser’s is a bold claim indeed, one very much out of philosophical fashion. In mainstream Anglo-American philosophy, the dominant position is that Hume and Kant long ago showed that the theistic proofs do not work. To overturn this verdict is a formidable task, and to accomplish it Feser needs to present a great deal of background material. The principal reason, he holds, that modern philosophers reject the theistic proofs is that, since the Enlightenment, they have accepted a truncated notion of causation. Today, philosophers think of a cause as one event, preceding another in time that brings it about. As an example, if I light a match, these philosophers would take this to mean that the event of striking the match is followed by the event of the fire’s appearance. This departs from Aristotle’s delineation of four causes, efficient, final, formal, and material. Aristotle’s efficient cause corresponds most closely to the modern view, but even here the resemblance is not very strong. Aristotle thought efficient causation involved a substance rather than an event: I, not the event of striking the match, cause the fire. To grasp Aristotle’s doctrine of causation, developed and extended by Thomas Aquinas and other scholastics, Feser needs to go back to Plato to explain the famous problem of universals. He argues against the view that universals are merely words or concepts in our minds. Instead, he favors the moderate realism of Aristotle and Aquinas. All this may sound abstract, but it is essential to understanding the way in which Feser thinks that God’s existence can be proved. Readers who are willing to cope with this rather difficult material will gain something else, besides being in a position to understand the theistic proofs. They will learn a great deal about the history of philosophy. I have never seen the topics that Feser discusses presented so clearly. It is an effort well worth the effort. –David Gordon, Ludwig von Mises Institute, for The American Conservative Union Foundation, Issue 120, November 19, 2008 –This text refers to an out of print or unavailable edition of this title. Professor Edward Feser argues here that Richard Dawkins has it all wrong. God is not a hypothesis, to be replaced if a more satisfactory theory comes up. Quite the contrary, Feser suggests, the existence of God can be proved by rationally compelling arguments. He thinks that not only is Dawkins wrong about this but so are his fellow atheists Christopher Hitchens and Sam Harris, all three of whom are frequently subject to humorous and telling remarks.